Product Description: Guaranteed to comply with strict European standards for heavy metals, PCBs, Dioxins, Pesticides and other unwanted compounds. 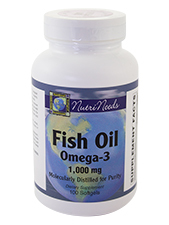 Our fish oil is molecularly distilled to remove PCB's, dioxins and heavy metals such as lead and mercury. The process also reduces the oxidation of the oil and helps keep it fresh and stable. Other Ingredients: Softgel (Gelatin, Glycerin and Water) and Vitamin E.
Does Not Contain: Sugar, Salt, Dairy, Yeast, Wheat, Gluten, Corn, Preservatives, Artificial Colors or Flavors. Suggested Use: As dietary supplement, adults take one (1) softgel capsule, two (2) times daily with meals, or as directed by a health care professional.